"Something new to do with catfish besides deep frying it! 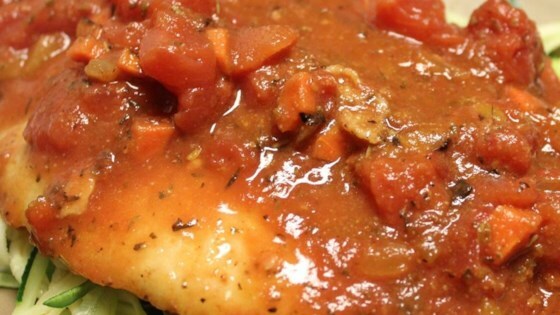 A yummy blend of tomatoes and italian seasonings make this a mild fish dish. Great if you don't care for that sometimes overpowering catfish taste. For a stronger fish flavor, try making the sauce separately and serving over grilled catfish!" Place 1 tablespoon of oil in a heavy bottomed skillet over medium heat. Saute onion, green pepper, and carrot until golden brown; remove from the pan. Using the remaining 2 tablespoons of oil, sear all of the fillets on both sides. Lay all of the fillets into the skillet, sprinkle with salt, pepper, Italian seasoning, and garlic powder. Top with the sauteed vegetables, and pour on the diced tomatoes, tomato sauce, and white wine. Bring to a simmer, and cook gently until the sauce has thickened slightly, and fish flakes easily with a fork, about 10 minutes. I will make this again, but I plan to try different seasonings as it seemed to be lacking a little in flavor. This was good but Husband said he would have preferred it with a different fish, maybe tilapia or cod. Thanks, Carrie! A good alternative to fried catfish, but not as tasty as fried catfish.